Unbuckle the GearGrip-Pro harness and lay it out on a flat surface with the inside of the harness facing up. Note: If you wish to adjust the position of the GearBag, it is easiest to do at this point while the GearGrip is not on the computer. 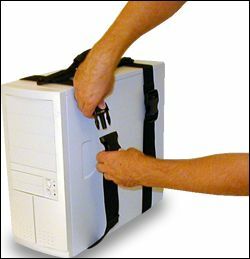 Place the computer in the middle of the long straps and bring the handle end over the computer. Connect both buckles as shown. Make sure the straps are not twisted. Tighten the straps by pulling down on the free end while keeping the handle in the center of the top of the case. Cinch the straps tightly! 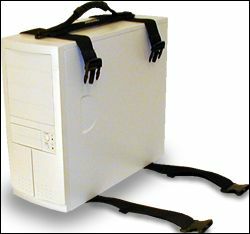 Only the tension on the straps prevents the computer from sliding from front to back. GENTLY LIFT THE COMPUTER TO MAKE SURE THE HARNESS IS PROPERLY ATTACHED. RETIGHTEN STRAPS AFTER THE FIRST FEW LIFTS. The harness will stretch and conform slightly after attached. BACKUP CRITICAL DATA PRIOR TO TRANSPORT! Computers are sensitive equipment, so handle with care. 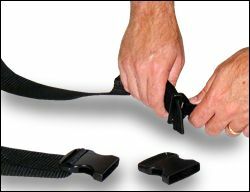 If it is necessary to remove a CableGrip, remove the GearBag and slide the CableGrip to the female buckle end of the strap. Remove the female buckle and feed the CableGrip past the folded end of the strap. This is a tight fit, but with patience it can be done. To add a CableGrip the process is simply done in reverse. Unbuckle the GearGrip - CRT harness and lay it out on a flat surface with the inside of the harness facing up and the "foot" loop closest to you (See photo). Place the foot of the monitor in the middle of the foot loop and guide loop around the foot. This may be easier to do with the monitor on its side. If your monitor is not equipped with a foot then simply place the monitor directly on top of the loop. Pull the handle and strap up and over the back of the monitor guiding the straps along either side. As needed, feed any cables through the back of the harness. Adjust the length of the straps depending on the size of the monitor. The optimal positioning of the harness is with the handle on top and the front edge of the triangle even with the front of the monitor. Connect all buckles and tightly cinch all straps. Make sure the rear strap that goes around the monitor is tightened first. The front straps may require additional attention as two straps feed through a singe buckle. This is to allow for the maximum range of adjustability. Coil and secure data and power cables in the CableGrip near the handle. This will keep them managed and out of the way during transport. RETIGHTEN STRAPS AFTER THE FIRST FEW LIFTS. "I am placing my GearGrip - Pro on a smaller case and the tails on the straps are too long. Can I cut them shorter?" Yes, you can shorten the length of the straps if needed. Leave at least 6 to 8 inches of strap so you have something to grip while tightening. To prevent the strap from fraying, use heat to melt the end slightly. Note that if you cut off the strap end you will lose the added safety provided by the folded end and it will be very important that you keep the straps tight while transporting. Modification will also void the product warranty. Often times we recommend that you simply use a rubber band to keep extra material out of the way. This allows for the unit to be used on larger cases in the future. "Will the GearGrip fit on my type of PC or LCD screen?" GearGrip products are offered in a number of sizes to allow for the best fit on each piece of equipment. Please make sure you look at the "details" page for each product, found by clicking on the product image, in order to see the size ranges appropriate for your equipment. If you can't tell with this information, please contact us and we will be happy to assist you further on identifying the correct size. Product will be shipped after your check clears. CaseAce Products offers a 30-day money back guarantee. If you are not completely satisfied with the product, we will refund the original cost of the product (less original shipping and any return shipping costs). Contact us for a return authorization number. Product must be unmodified and in "like-new" condition to qualify for a refund. CaseAce Products also offers a one-year warranty against defects in manufacturing. The warranty applies to the original purchaser only and to products that have not been modified or abused. We reserve the right to repair or replace the defective product at our discretion. Contact us if you have a warranty issue and we will determine how best to resolve the issue. We are able to offer shipping to the USA only. Shipping will be via UPS Ground (contiguous US) or US Postal Service (Alaska, Hawaii, US Territories). International customers, please visit our resellers for possible shipping options. CaseAce Products takes the privacy of your personal information seriously. Our practices are described as follows. We do not use "cookies" for any reason on our site. Sensative credit card information is only transmitted in encripted form. This information is never stored on our site, sent via email or transmitted within a URL. Our policy is that if we don't keep it, we can't lose it. Personal information is only gathered to process orders. This information will not be used for any further promotional activities by CaseAce Products and will never be sold or released to a third party. E-mail addresses gathered as a result of placing an order will only be used as needed in relation to that order. We will never sell or release this information to a third party. We use the security of one of the world's leading credit card gateway companies. We want to assure you of our commitment to privacy protection and security. If you have any questions about this policy, please contact us. All products we sell are to be used at your own risk. Computers are sensitive equipment and their transport is inherently dangerous for both hardware and data. Our products are not intended to provide any protection from damage. We assume no liability for the following: (1) loss or damage to your data or equipment. (2) Third Party damage claims against you. (3) consequential economic damages or incidental damages as a result of the use of our products.